Dissident Christians set off the Protestant Reformation in Zurich by holding a protest during which they defiantly eat sausages during a fast period decreed by the Roman Catholic Church. Birth of William Cobbett (1763-1835), English pamphleteer, journalist, and reformer. The Westmoreland County Coal Strike begins in Pennsylvania. The strike goes on from March 1910 to July 1911 and involves some 15,000 miners at 65 mines. Miners faced with bad working conditions, low pay, and coal company cheating in their measuring output go on strike when the coal companies reduce wages by 16% and announce that miners will have to pay for the equipment, including explosives, they use to mine the coal. The coal companies hire thousands of strikebreakers, most of them East European immigrants unable to speak English, promising them good wages and not telling them they will be working as strikebreakers. Police and hired thugs are brought in to attack miners, miners’ families, and even strikebreakers who try to leave. Police and security guards kill six miners, nine miners’ wives, and one bystander, and injure thousands of others. The strike eventually ends in defeat. 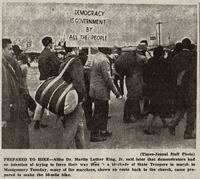 2,500 civil rights marchers led by Martin Luther King Jr. hold a protest walk two days after “Bloody Sunday” (a violent police attack on the first Selma to Montgomery civil rights march). After the protest disperses, three white ministers who participated in the march are attacked by segrationists, one is killed.